That's where we left off with Pretty Little Liars Season 5 Episode 5, as Toby's house blew up and, perfectly timed, everyone's phone also blew up with an A-like text alert. But there were so many other big things that happened las Tuesday and a lot of that swirled around Alison, whose return has sent everyone into a spiral. Moving forward, will Alison and Mona continue to slap the heck out of each other? If Emison is on, where does that leave Emily and Paige? And will anyone be on Alison's side since her lies continue to pile up? TV Fanatic: Let’s talk about some of those big moments in the hundredth episode like the Mona slapfest, as I call it. Those scenes are so fun for fans to watch but how is it to shoot? Is it stressful? Is it fun? Because you’re hitting her and she’s hitting you. Sasha Pieterse: It’s actually a lot of fun. We had a lot of fun doing it. But, honestly, Janel [Parrish] and I thought that was the greatest thing because, we didn’t actually hit each other, so we were having a lot of fun pretending to hit each other…I love doing my own stunts. It’s more fun than anything else. TVF: And it’s satisfying for the viewers because there’s been a lot of stuff boiling between Ali and Mona, so it was actually kind of good to let a lot of that out. Did you feel the same way as actors? SP: Totally. Thinking the way the viewers think, they basically wanted to hit either Ali or Mona so the fact that we’re hitting each other must bring them some satisfaction. [laughs] You don’t really know what kind of person Alison is yet. She’s all over the place, and you’ll see that more in the next few episodes. TVF: Ali and Emily - that was a big shocker that they were all of a sudden locking lips and that was very fun to watch. But at this point, how would you kind of define Ali’s sexuality? SP: That’s a good question because I think Alison did play with her and manipulated the situation before and the fact that Emily really had feelings for her but now everything’s kind of shifted I wouldn’t even say that I think she’s confused. I think she just really cares about Emily and this new form of love that they have for each other. But there are so many complications with it, too. You’ve got Paige and she’s got all this stuff going on and Alison’s just getting used to being home and the girls getting used to her being home, so there’s a lot of emotions at stake. So I think what you really saw in the 100th episode, the relationship between Emily and Alison, I think that was a long time coming and I think it was just a really sweet moment between them. That kind of summed up the way they were feeling about each other. And right after that scene they find out that Alison fought Mona and lied about it and so she really threw Emily for a loop right there because she does not know what she can trust Alison with. I think she’s kind of hurt by how vulnerable she let herself be and how she could be hurt so quickly by that. It will be interesting to see what the fans think about everything that’s coming up next. TVF: What are we seeing in the next episode? SP: I can tell you see pretty interesting things. [The episode] starts moments later from the big surprise of Toby’s house getting blown up and now everyone is checking their phones to see what messages they get and I mean that’s the biggest shocker. I think the greatest follow up episode because our hundredth episode is special and it’s just kind of great to see what viewers will think as well. TVF: Who would you say is Ali’s biggest threat right now? Is it Mona, Jenna, A, assuming A is back…? SP: I honestly do think that Alison is her biggest threat. I think she is destructing herself. But it all seems to stem from her and what kind of person she’s trying to be and it now just escalates and she can’t really get out of this hole. But because of the hole she’s created she’s facing Jenna and Mona and Lucas and all these people that are kind of ganging up against her. Mona is trying to get across the way of protecting herself but she is more selling me out than anyone else. Mona has always had it coming with the girls especially because we know what she’s done. We all have to be careful, everyone’s on their toes, no one feels like they’re safe. But I think honestly, to answer your question. I think Alison is her own biggest threat. 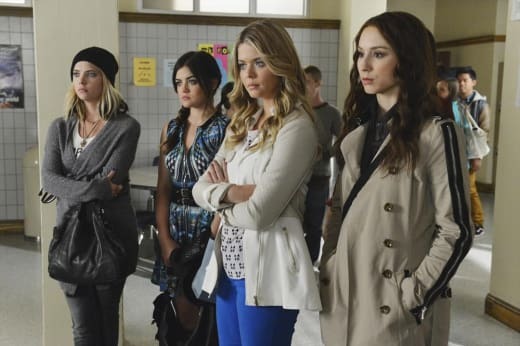 Pretty Little Liars Season 5 airs Tuesdays at 8/7c on ABC Family.